Nowadays many people around the world know about the health benefits of omega-3 fatty acids and fish oils. Most of them know that omega-6 fats promote inflammation, on the other hand omega-3s protect against many different diseases by reducing inflammation. Fish contain a variety of fatty acids, but the ones that are believed to confer the majority of the benefits are the long-chain omega-3 fats eicosapentanaenoic acid (EPA) and docosahexaenoic acid (DHA). Research has it that omega-3 fatty acids help with the maintenance of normal brain function and normal vision (particularly DHA). These fatty acids help with the normal function of the heart and help to maintain normal blood cholesterol levels, hence they help to keep blood veins and arteries healthy. There has been a lot of evidence in the scientific field about the health benefits of omega-3 fatty acids regarding the reduction of post-workout inflammation and delayed onset muscle soreness (DOMS), and with larger daily doses (1 g fish oil/bodyfat percentage/day) they may increase lean muscle mass and decrease the bodyfat percentage. In modern countries due to vegetable oil consumption (basically all the unsaturated fats are from omega-6 origin) the ratio of omega-6: omega-3 has move up to 20:1 in the average population, while in modern hunter-gatherer tribes that are free from modern inflammatory diseases (heart disease, cancer, diabetes, etc. ), this ratio is roughly 1:1. So what should people do to bring a balance to their omega-6:omega-3 ratio? 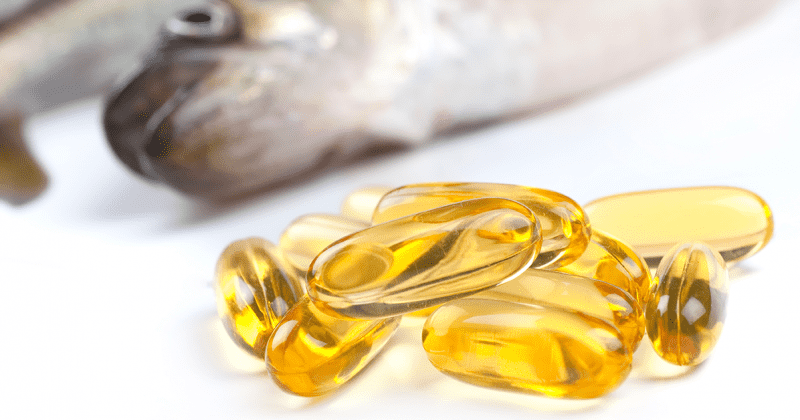 First of all, it is crucial to cut down the intake of omega-6 fatty acids from vegetable oils but it is also important to increase the omega-3 consumption from seafood and carefully chosen omega-3 fish oils. This does not mean that you should run to the first store, pharmacy or whatever place where you can buy omega-3 products, cause most of those are useless anyway. 1. Some fish oil supplements do not even state the origin/source of the fish oil. 2. Average fish oil supplements might be kept on the store shelves for years before someone even buys them. 3. There is usually no or false information about the oxidity and rancidity of the fish oil (TOTOX – total oxidation value). The source and the origin of the fish oil, so the fish itself can tell a lot about its toxicity. Most fish have some heavy metal poisoning in the sea depending on how big they are and where they are located. Bigger fish; and fish close to the sea surface accumulate a lot more heavy metals than the ones which have never even touched the surface. Same goes with the smaller fish types. So in order to choose a good species lacking toxicity, you would need to search for a small type living in the deep sea, not so close to the surface. The longer the fish oil is kept in the bottle/capsule, the higher the risk will be for oxidity, rancidity, burps with a bad smell. Due to these things the biggest problem of all is that the fish oil would become harmful instead of being harmless with just health benefits. Now let me give you a basic knowledge about the TOTOX value. TOTOX – the value of total oxidation is a freshness measure (the lower the better). A low number is actually an indicator of careful fishing, rapid collection and fast oil harvesting under controlled circumstances (cold temperature, no exposure to direct sunlight during the distillation procedure). The value comes from the equation of TOTOX= 2xPV+AV, where PV is the Peroxide Value (always the smaller number) and AV is the Anisidine Value. The EU maximum limit is standard (TOTOX <20), so it is a good idea to choose a product that has a lower value even at the date of expiry (meaning that in the production year it must have been way smaller!). Lastly, it is also important to know the percentage of the omega-3 fatty acids that are in triglyceride form. Higher percentage means better bioavailability! So where can we find a reliable fish oil source from small deep-sea fish – lacking toxicity – with a low TOTOX value and high percentage of omega-3s in trigliceryde form? I think I know the answer! Scitec Nutrition’s WOD CRUSHER functional line has just got bigger. They have given the Crossfit community a highly concentrated omega-3 product, with a reliable fish source (Peruvian anchovy), low TOTOX value and a well-balanced EPA and DHA ratio, most of them in trigliceryde form! Your body is a machine so you have to “oil” it regularly. 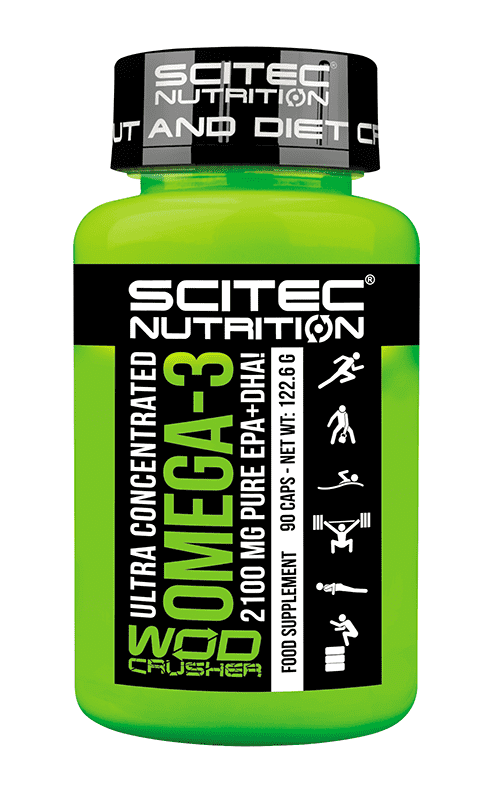 Supplement your diet with this high quality, highly concentrated Omega-3 formula! The quality and purity of WOD CRUSHER’S ULTRA CONCENTRATED OMEGA-3 meet the most stringent EU standards, including a low TOTOX value, which is lower than 10 after 2 years! This fish oil is from wild, small, deep sea fish (Peruvian anchovies) generally known to contain almost undetectable amounts of toxic material. This innovative formula contains 78% Omega-3’s, including a balanced 1200 mg EPA and 900 mg DHA in a 3 capsule serving! Moreover, 90% of this fish oil is in triglyceride form and it’s well documented in scientific literature that triglycerides have a very high bioavailability! ULTRA CONCENTRATED OMEGA-3 is neutral in taste and smell; and contains Rosemary extract and Tocopherol as antioxidants. DHA helps with the maintenance of normal brain function and normal vision. The beneficial effects are obtained with a daily intake of 250 mg DHA. 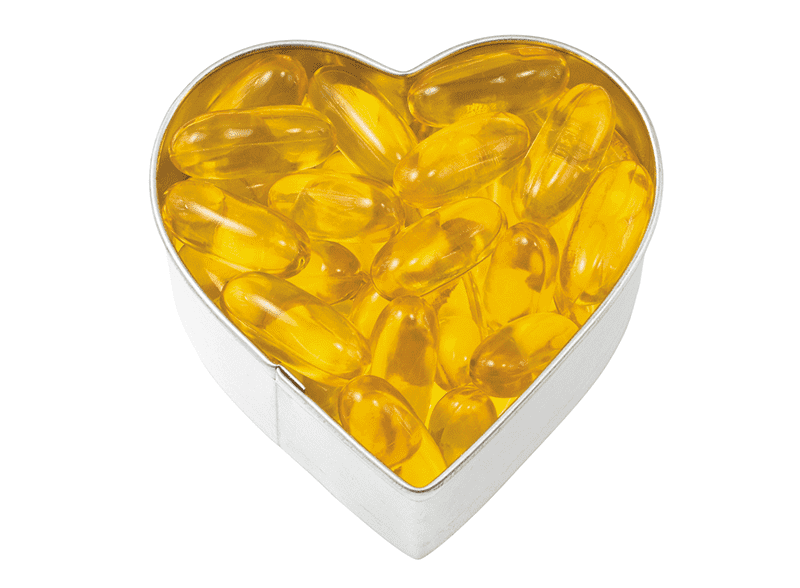 EPA and DHA contribute to the normal function of the heart, which effect is obtained with a daily intake of 250 mg of EPA and DHA. In addition, replacing saturated fats with unsaturated fats (like EPA and DHA) in the diet contributes to the maintenance of normal blood cholesterol levels.